Seriously, Amazon actually needs their own theme music. Amazon needs their own syndicated series, for God’s sake. Why? Because Amazon’s become the mega-giant that could very conceivably take down the heavy hitters like Google and Apple easier than a sumo wrestler can take down a gnat. There’s just one question you have to ask, though (if you’re Clint Eastwood) — Do you feel lucky? Punk? Apparently, Amazon’s been feeling lucky. Back to tablet technology, this remains glaringly clear: it’s all the rage in cyberspace. Computers everywhere are losing their keyboards like evolution’s losing the legs on a salamander as the water level gets higher and animals must survive with fins and gills. It’s natural progression, baby. That’s the state of technology. So the obvious move, from Amazon, is to get in on that technology. That’s where the Kindle Fire comes in. Amazon! No surprise there. And it makes perfect sense. You can now get on amazon.com with ease without sitting at the desktop, or even using a laptop. A nice touchscreen, a trip on the bus, or just sitting at the beach with your Kindle Fire, and you’re in shopping heaven. There is a catch, though…. 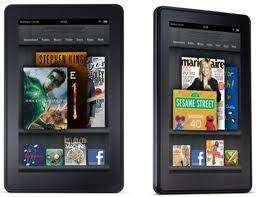 We’re looking at small businesses here: is a Kindle Fire helpful? Necessary? Does it benefit a company? For one thing, it mobilizes your needs to work on your business through the computer. You can do your paperwork right on a tablet, sync it with your printer, even check your e-mail. You’re not confined to your desk, you eliminate cords completely. In a nutshell, it makes your office life much easier. For instance, buying movies, buying books, buying toys, buying anything. It’s all about Amazon. That holds some value for a business, as your company needs to keep stock of materials — paper, business cards, equipment, etc. etc. — and there’s nothing more convenient than making your orders on a handheld tablet, right? But that’s not nearly as important as keeping your business going. Communication. Business operation. The bottom line is, really, the Kindle Fire isn’t a true tablet. It’s intended to serve the Amazon customer. Period. Still, that price point of $199 is pretty sweet! And what else can you expect from Amazon? The Fire, though, obviously isn’t in direct competition with the rest of the android tablets and the iPads out there. It wasn’t meant to be. This, however, may be the start of a really big showdown. After all, the iPad came out — and the iPad 2 came out — and we may soon see an iPad 3! 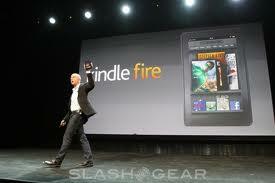 The release of this Kindle Fire may be the beginning of a major blowout competition. Don’t forget, this is Amazon we’re talking about. While this magic carpet ride of consumer magic may have a majority of the buying market in a big way and not the tech know-how to break the molds with things like tablet technology or Wi-Fi stuff, Amazon is so big that they just might pull off big sales anyway. So maybe as a small business you’ll want the best savings, snag a Fire, and call it good? Ask Dirty Harry. Or Captain Kirk of the starship Amazon. Either of them can make your day! This entry was posted in Employees, Small Business and tagged businesses, communications, computers, content, Kindle Fire, small business, technology by Pierre. Bookmark the permalink.